A woman who loves her family, loves her man and loves her God! I had fallen asleep with worries, concerns and a heaviness on my heart that I lifted up and casted onto my God. So when I woke, I had slept well, was filled with peace and knew those new mercies of the morning!! I started a load of laundry and just knowing how different that process was from what you just envisioned makes me laugh out loud. Let me paint that for you… I went outside to the rain barrel that had been filled with water from the river as it still isn’t raining. I filled the kettle and placed it on the gas flame. As it heated I placed the clothes, soap and bleach into the ‘tub’. After pouring the hot water in, I began the ‘wash cycle’ by taking a big wooden spoon and swishing the water, again, simulating that wonderful invention of the agitator. Then Theresa came in with the morning delivery of Mandazi (donut holes), packed in a brown paper bag, soaked with the grease they were cooked in. (Ahh yep, I don’t eat these!). As she was leaving, I handed her a package of plastic bags she usually packs them in. She literally raised her arms and thanked God. A $1.50 offering and this woman knew from Whom it came!! I was moved. Our plan was to load up and drive to Sengara at 9am. 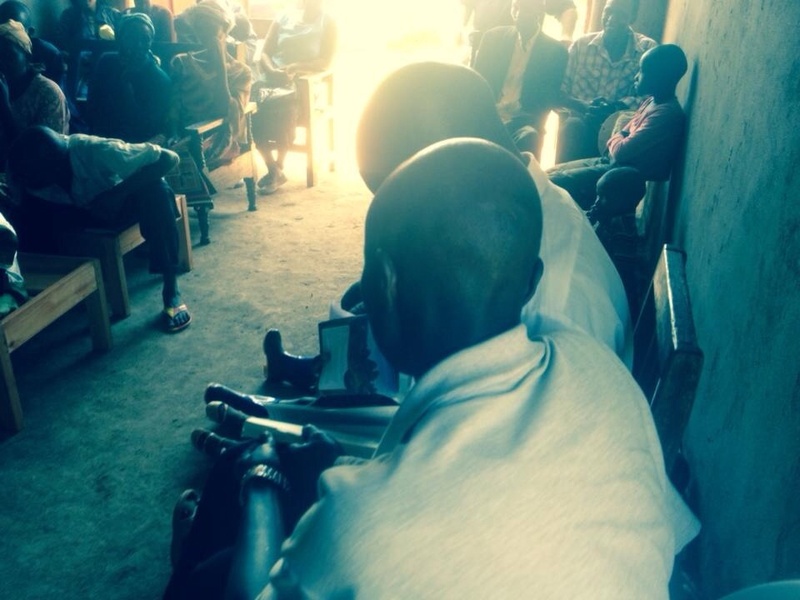 Peter, a former Muslim, had requested we come and share “the good news” with his father, a man steeped in the animistic traditions of spirits and witchcraft. Just as we prepared to leave, a large truck pulled down our lane. After meeting them, Randy says, “this might take a while”. It was the Assistant Chief and another man. I immediately expected trouble. But these men had heard about the hen project and are wanting to start something similar on the next mountain. He was impressed with the project and the guys were more than happy to share all that they’ve learned. After returning from Sengara, the guys were gathering in the hut for devotions with Denis. 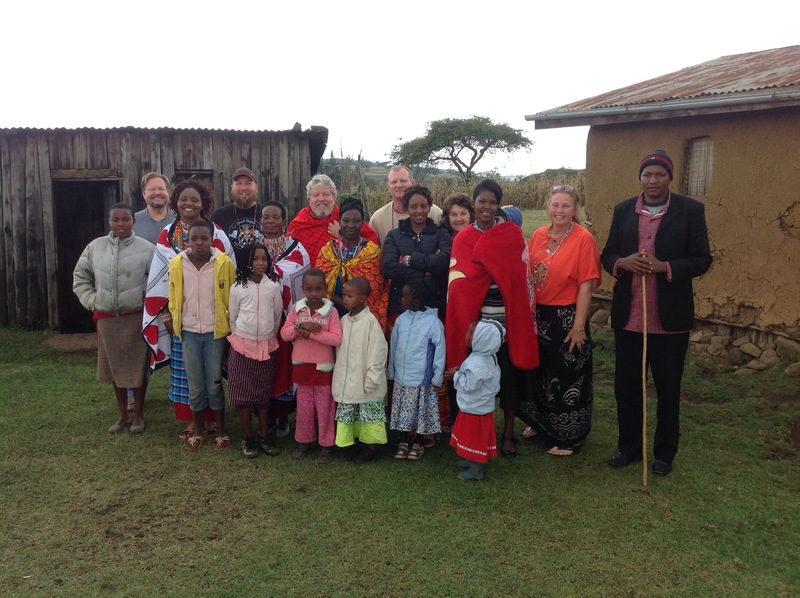 Just then a piki arrived and in came our Maasai friend, Paul and his friend, Moses. Moses, Paul, Randy and I spent nearly 2 hours discussing Paul’s difficulty in leaving the Mormon church. 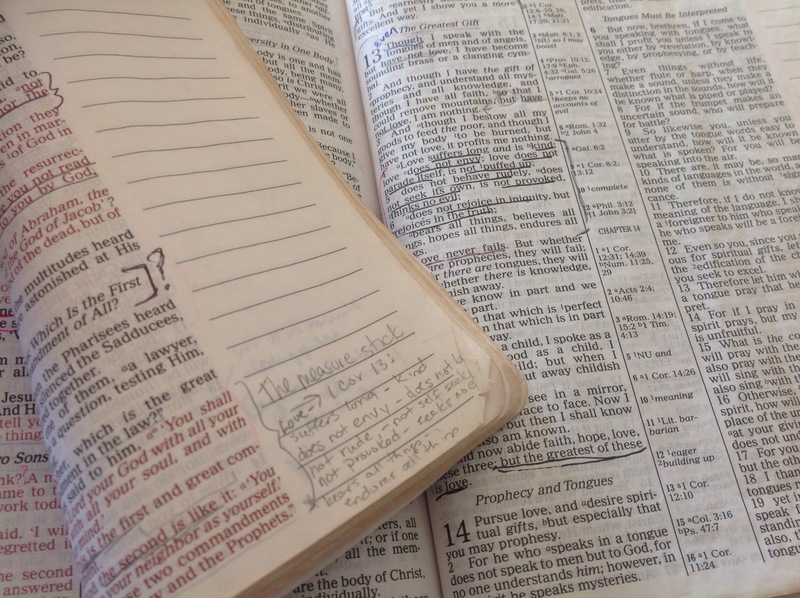 He has encountered struggles and although God revealed to him through His Scriptures, the falsehood of the Mormons, over a year ago, he has remained associated with them. Recently when he was visited by an elder in this cult, his people were found unable to answer questions about the book of Mormons, they only knew about the Bible. Paul was questioned and reprimanded. Randy sternly – with so much love – warned Paul about delaying his obedience to God. He told him he needed to repent to God, confess before his flock and break away… Immediately. Please be praying as this could result in great difficulty for Paul. Right after Paul and Moses left, Randy called for me to come and greet Nelson. I love Nelson. A wonderful mzee (old man) in the village. Nelson and his friend Enoch sat in the hut. Both with their hats and their canes in hand. These grey headed men, dressed in suits with hands that display a lifetime of hard work just seem to naturally demand a respect that I tried to express in our greeting. The pleading in these old African fathers’ eyes, as they politely held their hats and canes, broke my heart. “Truly that is so!” We prayed together and with tears I asked God to work! The men then got up from the little stools in the hut, place on their hats and proceeded to walk to the project. They were given a tour by Meshack and Rogers, both who 6 and 12 months ago they would have been staggering drunk by this noon hour. I watched as Meshack and Rogers showed them their work. They spoke the mother tongue, Akeguisi. I know a few phrases and recognized several times as they would stop, turn to face their visitors, talk about Yesu – Jesus, the Bible and “Roho ya Mungu” – the Holy Spirit. Tears filled my eyes and praise… Sincere praise… Filled my heart. Oh my God is so so amazing!! Alafu… And then… I had another visitor. Aska. Aska came for prayer for her back. Aska is 96 years olds. She works in the shamba every day. She walks miles a day. Today, she quietly motioned to her back and in moans and broken Swahili – both hers and mine – we communicated and prayed. Aska blesses me. With double language barriers, this woman warms my heart by her kindness, love and faith in Jesus to ease her pain of age and hard work! Ahhhh… It’s dinner time!! Randy, Craig and Chase go out to the hut for evening devotions with our guys. I put on some praise music and begin cutting potatoes and onions for dinner. Several times I would stop, overwhelmed with the evident, day filled proof of God’s goodness. Going over the day, the visitor packed day, I could only give glory to the One Who orchestrates, Who woos and pursues the heart of man and Who is allowing me to sit in the very front row of His Amazing masterpiece and workmanship!! Just then Chase comes into the kitchen. “That was amazing!” He shared about the devotions and how the guys went around, each sharing what God had shown them just this week. He told of how they eagerly shared and how sincere they were. He was moved as he saw the results of God revealing Himself. After we ate dinner we had our prayer time. Tuesday nights are focused on the ministry we are doing here in Kenya. Our prayer requests include many needs but today…. Our prayers were all filled with praise, thanksgiving, and giving glory to a God who NEVER takes a day off!!!! I don’t feel like it!!! I don’t feel like it! It started with a tickle in my throat. A few days later I have this heavy wheezing, awful cough, and basically feeling worse than bad. I confess, I get a little panicked every time I have a respiratory thing. After all, just over one year ago, in a matter of seconds, I went from hearing to not. I held my nose and blew. I yawned. All in effort to pop my ear. Nothing. Then I was told that my hearing in that ear would not likely return. Gone. Completely. So, after 4 bouts with something in as many months, I have allowed myself to get a little cranky. I curl up in bed, I doctor myself with every home remedy I can research, and I pray, “please, Father, don’t let me loose my other ear”. So… when time came for my Thursday night Bible Study, I snapped at Randy, “I don’t feel like it, tell them I am sick”. “You have to go, they are expecting you”. With not an ounce of graciousness… completely void of any semblance of love… I dragged myself out of bed, threw on a wrapped and pouted out the house towards the church. I didn’t grab my Bible. I didn’t pray. I didn’t apologize to Randy. I didn’t feel like it. Sure enough… Leah came in, then Mary. Just the three of us, good this should be short, I thought. The other 8 or so women didn’t come, my booklet of verses I had had printed and were to be delivered for them all hadn’t come… and… I didn’t feel like it. So I was totally expecting a quick prayer… a few back and forths… and… Kwaheri, tutaonan! Bye, see you! First, Leah shared about a hyena that had been outside her house the night before. She shared about the fear that rose up because of the witchcraft that is thought to be associated with them. She told me of how she called Pastor Rueben and he had prayed with her and she sat there reading her Bible until she fell asleep. I was quick to remind her – God says, be strong and of good courage, for the Lord your God is with you!!! He has NOT given us a spirit of fear – but of love, courage and a sound mind. We just submit to Jesus, resist the devil… and… HE WILL FLEE!!! I had an answer for her. It was truth. And it came forth from my mouth with instinct. Heartless, loveless, but purposed truth none the less. Then Mary, in Akeguisi, the mother tongue, began to share as she ruffled through the pages of her Bible. She was looking for something specifically. Then she started to read. Leah then read it in English. I Corinthians 13. Though I speak with the tongues of men and of angels… though I have the gift of prophecy and understand all mysteries and all knowledge and though I have all faith, so to move mountains… Though I bestow all my goods to feed the poor… though I give my body to be burned… …and have not LOVE Sounding brass, clanging cymbals, I am nothing, and it all profits me… NOTHING! Mary was feeling condemned. Mary was feeling loveless. This sweet precious woman who earlier in the day I had asked to fix lunch for 10 extra men with no thought of her time, no thought of the effort and work necessary, this woman who said to me, “no problem” in her heavy African accented English…. was feeling unloving. BETWEEN the eyes… the entire message… straight between the eyes! First… fear. Honestly, I have battled this fear for over a year. The last thing the doctor said to me after several attempts to glean some hope… “take care of that other ear and don’t let things go untreated.” I actually hear his voice in my head. Fear. Curled up in my bed, fear. Pleading with God, fear. Then… love… I just spent 3 months back home studying 1 John. What manner of love has the Father lavished on us… that we should be called… CHILDREN OF GOD!!! He who does not love, does not know God, for God is love. Beloved, if God so loved us, we ought also to love one another. In this the love of God was manifested towards ME…. That God sent Jesus, to die for me… that I might live through Him!!! Based on His prayer in the garden… I’m pretty sure… Jesus didn’t feel like it. One thing I have learned is that I can’t do it. I can’t even pretend to love… because lots of times… I just don’t feel like it. But He has called me to love. He has set that as the highest command… love the Lord your God with all your heart, all your soul and all your mind and the second is like it… Love your neighbor as yourself. THIS is my measuring stick. This is how I must judge myself, 1 Corinthians 13. Oh Jesus… Forgive me! I have been selfish and unbelieving. I have taken my eye off You! Forgive me! Fill me with YOU, YOUR Spirit, YOUR Love! May I be kind and gentle, may I suffer long, not envy, not be prideful, may I not behave rudely or seek my own need or purpose, may I not be provoked or think evil, may I not rejoice in iniquity but may I rejoice, may I dance and may I live in TRUTH… May I bear all things, believe all things, hope all things and endure all things!!!! I need YOU! I need Your grace! I need Your love! I need Your Holy Spirit! May I be obedient to You, may I be quick to love You by loving others… Even when I don’t feel like it! I leave in 2 weeks and for the first time, really, since coming to Kenya, am feeling torn. You see, I watched God do something today that moved me to tears and a state of being speechless. 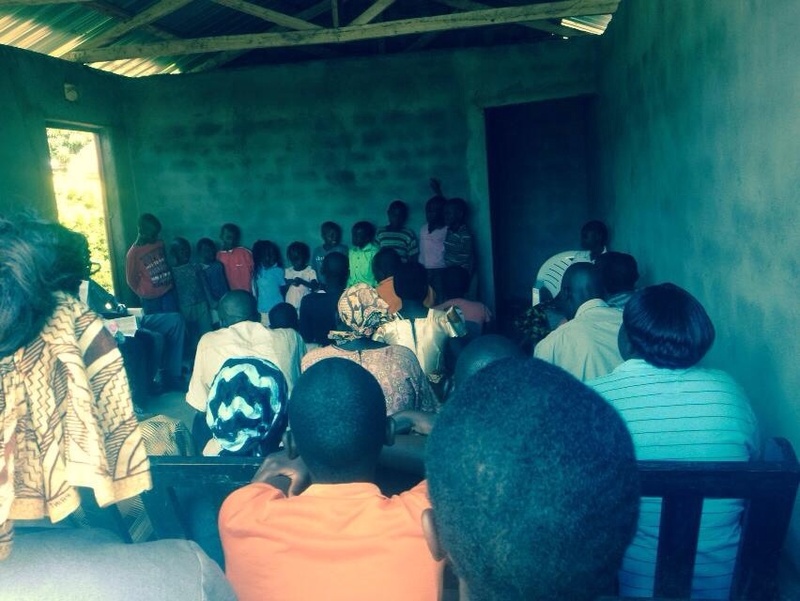 This week, after visiting a family in the village, praying with them for salvation, we felt we could no longer wait for a church in the village. We felt God telling us – it is time! One of our guys made the suggestion of using our car park – the garage. PERFECT!!!! So, we began to invite our neighbors and Randy prayed about what to teach. He decided on Acts. Today – after moving out the car, taking every stool, chair and bench we could find – we had 42 people come for church!!!! One by one they came. We would shift, kids moving to the ground, some sitting on laps, through out the morning we kept making room. I have to tell you, at one point gasped with an absolute amazement of what God was doing. through Jesus and His gift of salvation. And then I shared just a little, thanking them for coming and sharing my excitement. We told them how much God loved them and how HE was going to do beyond what we or they could think or imagine. I then asked if anyone wanted to share a testimony… “tell us what God has done in your life this week”. brew and how it had ruined his life. Then he shared how Jesus had saved him and how He had changed his life. I stood there watching his wife’s reaction and it was nothing short of agreeing praise! After that, Otara got up. “You all know me. I have been selling brew for years, my wife and I .” He went on to tell of Randy and I visiting this week and how he had prayed to Jesus. He said he doesn’t want to sell brew or drink anymore. THEN – Grace, Otara’s wife, jumped up to follow and started with a song. She said that God had done a miracle in her home this week. I watched her oldest teenaged daughter watching her mother as she spoke. With a sweet smile, I could see in her eyes that she had seen the change herself. Please join us in praising God and calling on Him to, indeed, do beyond what we can think or imagine…. For HIS glory…. In the sweet people of Kebabe and the new Garage Church! As we traveled back to the village on Monday, tracking a flight going in the opposite direction, and as we go about our weekly schedule, I am grateful to my God for the incredible blessing to share the last 10 weeks with Terry Combs and the last two with our friends Chris Black & George Kleer, along with our son, Ryan. To actually share what has become our life in this season that God has placed us here… Well, honestly, I have no words to describe. Terry came the end of June and started this term with us, assisting in our 4 weekly classes. She would do the story each week and helped me in the administration, attendance taking and distributing class material. The first week the guys were here, we just dragged them along with us on our regular schedule. They each taught a portion in our study of Romans. It was great to hear their teaching and for our students to see that verse by verse example. Dennis, the young man who interprets for us and the one we see God raising up, had his challenges trying to understand the slang of three more wazunga! Especially as Ryan tried to work in “Hakuna Matada” as often as possible, even when it didn’t fit. We had fun! In the village, Terry was quickly embraced by all our friends and will be missed greatly! As she slipped right into our routine, she shared our load amazingly and we have already, when asking if something had been done (like taking mandazi to the jikoni or giving cookies to the children), we’ve both said, Terry always did that! I suspect we will be discovering more and more which will lead us to further thank God for the blessing of sharing in the work with Terry. The guys from the Hen Project spent lots of time with our guys from back home. This was a blessing to the guys here, to be so involved with the “visitors”, the fellowship and encouragement. A blessing to the team, to see the work God is doing in these lives, both the struggles and the victories. And a blessing to us, to share the two lives together…. Pamoja! We had a few days in the village and then headed to the Mara! It was spectacular as we saw one of God’s great display of the work of His fingertips… the great migration across the Serengeti. It truly was amazing! In addition to the 100s of 1000s of wildebeest, we saw a Rhino, lions, hippos, cheetahs, a hyena, elephants, giraffes, zebras… Many other animals… AND… Our first leopard!!! Wow, what a work of our God! Overall, the greatest blessing has truly been the coming together of our two lives. To share one with the other. To have some of our team and family from back home connect with the work and our family here is an answer to prayer! 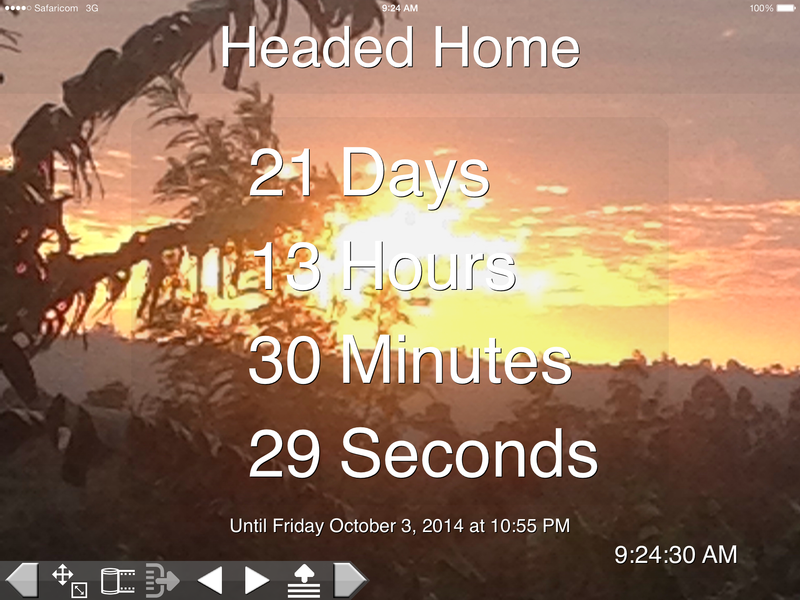 It’s hard to believe I will be traveling back to Nairobi in just over two weeks for my own airport run!! Oh yeah, grandkids and big kids… In my arms within the month!! To say I’m excited is an understatement! I will head to Nairobi on the 27th, taking a flight on Oct. 2nd. Because of our class schedule, Ran will head back to Kisii on Monday and I will fly out on Thursday. My flight goes through Atlanta. When I realized that, I had to plan to stop off to see my Aunt Bev. She is slowly recovering from a stroke she had six weeks ago. Her birthday is on the 4th, so I will be joining my parents to celebrate her birthday and then driving home on Sunday with them. Then… I will be filling my arms with little and big SaulGood children! Randy will be flying home the week of Thanksgiving. 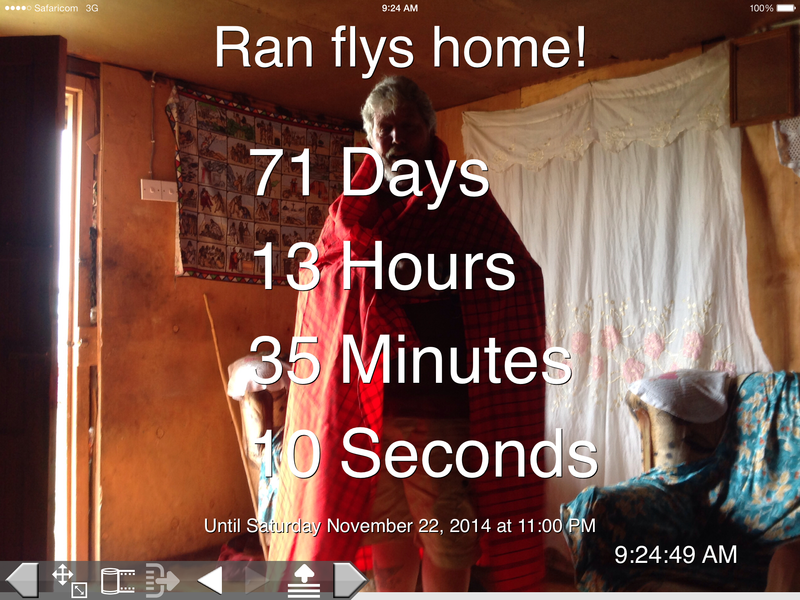 He will return to Kenya Jan 1st with our friend Craig Esbolt. I will return January 20. What’s the plan you ask? Well…. I’m glad you asked! Firstly, to snag a phrase from some missionary friends, we are looking to develop our partnership!! 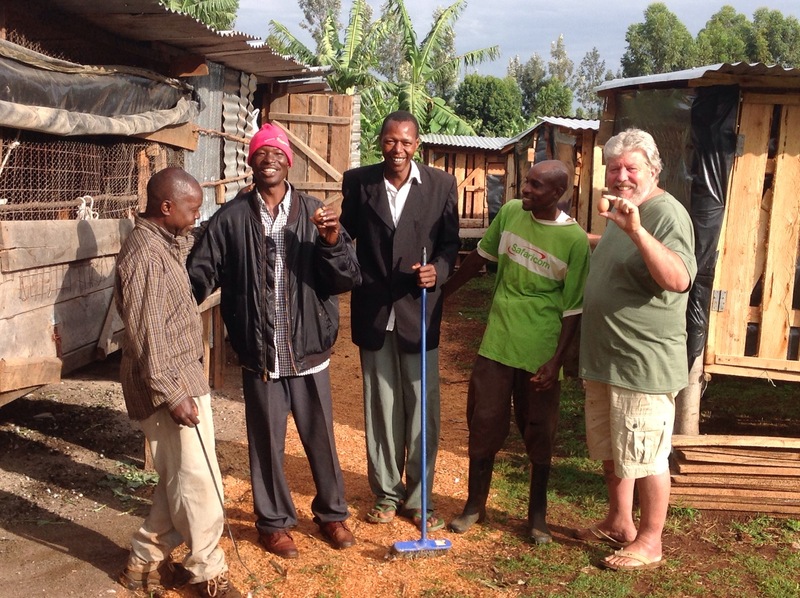 We would (I would, based on the schedule) LOVE to share with you, your small groups, Home Fellowships, Bible studies or church, about the work here in Kenya and all God is doing. These two years have been an amazing adventure as we sought to trust and obey a God Who is faithful and mighty! Please, if you are in Canada or the US and if you want to schedule something, let us know! Be watching for details of our “KENYA debrief”! We hope to see you there! We will have a few needs while we are home, biggest of which will be transportation. Please join us in prayer for this and additional needs The Lord knows. Please also pray much for Randy as he spends 6 weeks solo. The classes continue. The project continues. We’re adding Sunday church, and the preparations for him to be gone from here for 6 weeks will involve much. Pray for God to direct each step and to raise up those we need to watch over things. And tonight…. We sold our first flat of eggs!! Bam! These guys have worked so hard, not only on the project, but also in their spiritual walk! Randy is now meeting with them every night, sharing scripture and praying together! Moses, the last to return from UTurn, has dramatically been transformed! His wife, Mary shared that “God had helped the family so much”, Moses now stays home at night and works around their home and for the first time in all their married life, when the kids needed school fees, he reached in his pocket, gave them what they needed and sent them back to school! He listens to the audio Bible every night and his entire countenance has changed! He is a brilliant trophy of God’s sweet redeeming grace! Last night, Wilma visited me and told me that Meshack is reading the Bible every night and praying with her before they go to bed!! Hezborn, a new daddy, is constantly being encouraged to lean on Christ and walk for Him. The guys desperately need your prayers. The struggle is real and it can be vicious! But when we were invited to Otara’s, the village supplier of the local brew, these guys didn’t know what to expect. Last night, as we all walked over there, we laid it on the line…. “Otara, you need Jesus”. We shared the Gospel and Randy prayed with him to receive Christ!!! Oh how we are praying!!! This is huge and will be a major testimony!! My women’s Thursday night study has focused much prayer for just this!! God is rescuing this village, one heart at a time! 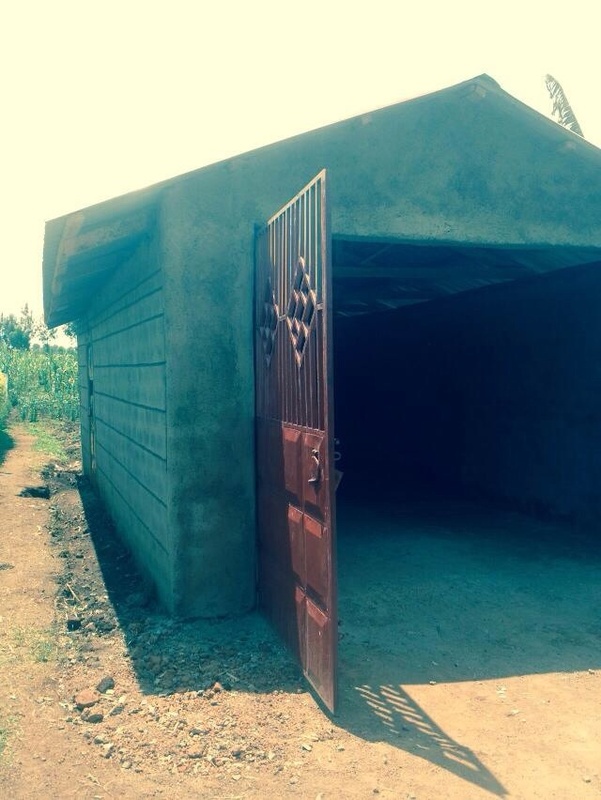 This brings us to a need… Please be praying as this village needs a good Bible Teaching church!! We need a pastor! And as we continue to pray for God to raise someone up, we will begin again with a Bible Study on Sundays. We did this last year, but lost our location when we came back. Well…. God recently provided for us to build a car park for the car. This was necessary for several reasons, but now I see even more clearly… On Sundays, we will move the car out and the car park will now be our church!!! Can you stand it?? I know, right? God is just amazing! I recently looked at discipleship in my quiet time. How God has called us to go and make disciples. This has been our focus since coming to Kenya, but now… After considering the impact of multiplication, the impact of making disciples who will make disciples who will make disciples… Yep, God is working the harvest for sure! The FIVE DAY Chicken Challenge!!! So… On the tail of VBS at CCPH and the kids raising the money for 100 chicken!!!!! 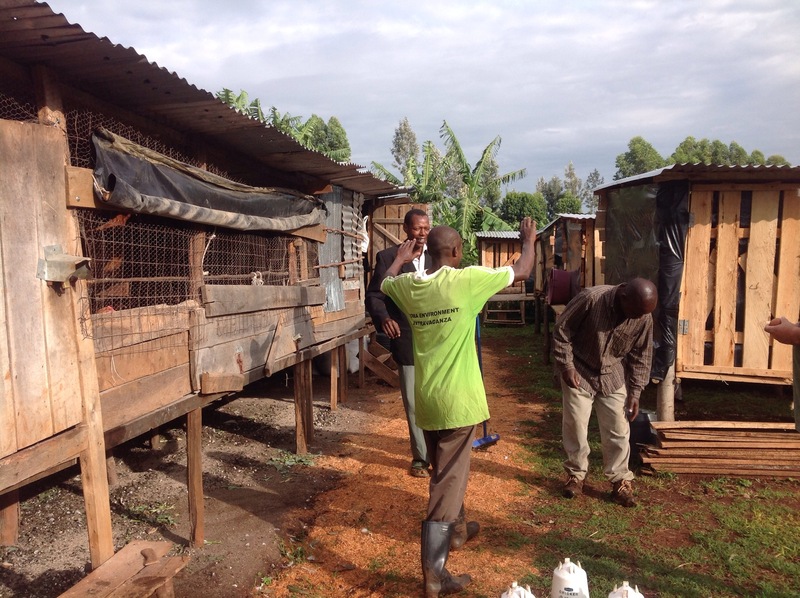 And as our guys in the village project complete the 5th Hen House…. 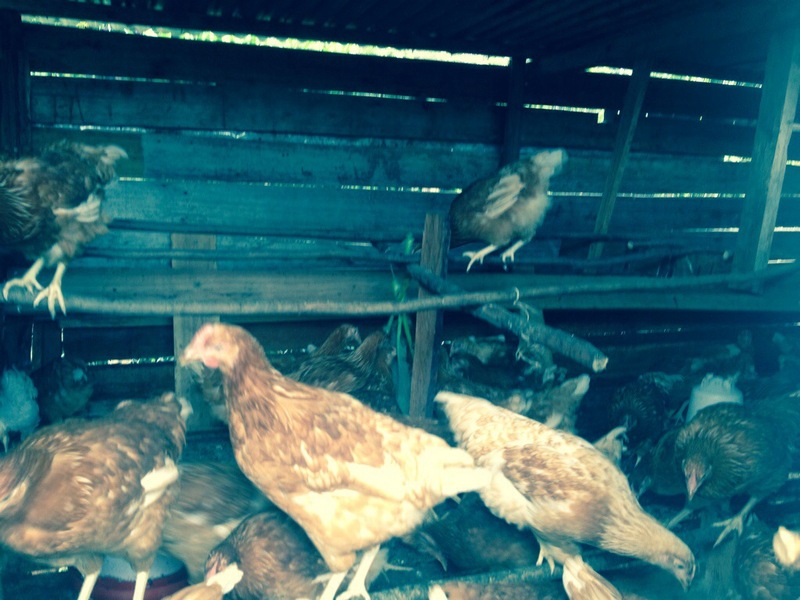 Just waiting for hens… Here is a FIVE DAY CHICKEN CHALLENGE… Prompted and posed by our good friend Dave Negri…. I heard that each hen is only $3.50 each. That’s great! For every hen donated through face book I’ll match up to 100 hens. Ok friends and family… The challenge is ON!!! And hey… Perhaps someone might want to pick up the match when it goes beyond Dave’s and we will fill ALL FIVE HOUSES!!!! Here’s the link to give….